In this whimsical mystery novel written for all ages, Grandpa Kingsley takes his family along with the reader on an unforgettable adventure where imagination and reality collide. In “The Conjunction of the Realms (Part One),” Maureen Cardoso is the Kingsley’s youngest daughter. As a child, she dreamt of being a scientist; she followed current discoveries and was fascinated by DNA sequencing, molecular structures, and genomes. By age ten, she had memorized the periodic table of chemical elements. In spite of her scientific side, she carried strong artistic traits that led her to write poems, stories and children’s books. Maureen studied macro-biology but interrupted her degree to have Philly, her firstborn. She always carried a pen and paper with her because she was also a writer. Paulo, her Brazilian husband, tried to give her an electronic pad or tablet, but she preferred her paper notepad, claiming that a true writer will use napkins if necessary. A small, local publishing company had picked up some of her children’s books. Still her hope was that someday her books would make it across the isle, into the hands of one of the more prominent publishers of London. With the advent of electronic publishing, Livre Press, Inc. is making Maureen’s books available for download on Amazon, iBooks and Barnes & Noble in 2014. Look out for the announcement. At age 10, I wrote a song about a little gnome who loved to row his boat on the sea waters under the moonlight. He loved the moon because he thought it was made of vanilla ice-cream, so he followed its reflection on the ocean hoping to reach that inexhaustible supply of his favorite dessert. 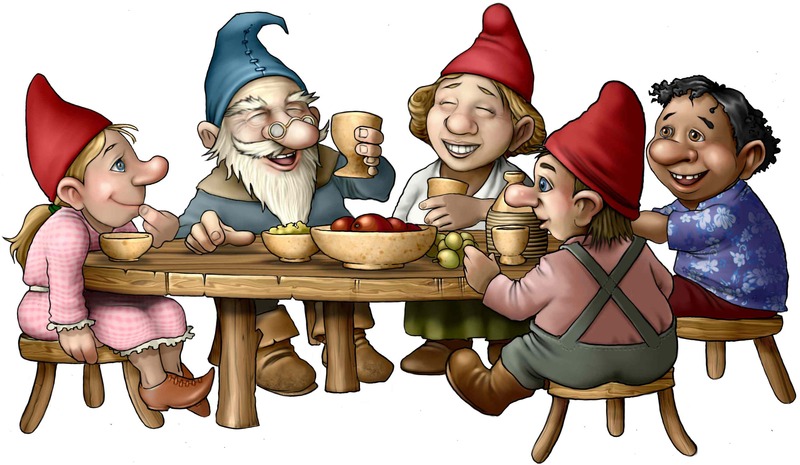 My sister Esther and I grew up hearing fantastic stories about gnomes, my favorite being one whose name was Laddy Dah. Our dad, Phil Kingsley, was quite the old Irish story teller. It is no wonder that at age 10, Laddy and his family were alive in my imagination. His wife’s name was Lynda and they had three kids: Lyle, 11, Lilly, my age, and Cousin George, 12. Dad’s stories were animated and rich in content. Laddy was always at the center of them. When my first son was born, I began to cogitate on the idea of writing and illustrating Dad’s stories so they would be preserved for our family. I thought of a kids’ book format where each chapter would be a voyage and Laddy would be the guide to take you, dear reader, through amazing imaginary places. This story is the beginning of your journey. There are many more to come from Dad’s story repertoire. I hope you enjoy them as much as I did growing up and as much as I enjoy telling them now. 2013 © Livre Press, Inc. All rights reserved. Reproduction in whole or in part is not permitted except with written authorization from Livre Press, Inc. This entry was tagged Amazon.com, Barnes & Noble, ebook, gnomes, ibooks, Italy, kindle, Sandra Alex, The Conjunction of the Realms, Vesuvius. Bookmark the permalink.